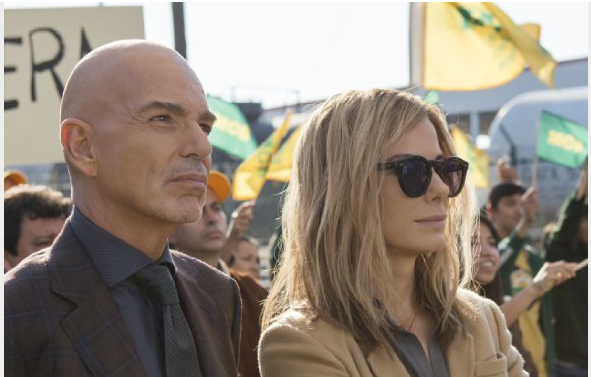 See Sandra Bullock and Billy Bob Thornton like never before in ‘Our Brand is Crisis‘ from director David Gordon Green (‘Pineapple Express‘). The film comes from a screenplay by Oscar nominated Peter Straughan (‘Tinker Tailor Soldier Spy‘) and suggested by the documentary by Rachel Boynton which outlined the American political campaign marketing tactics employed in the real-life 2002 Bolivian presidential election. A Bolivian presidential candidate failing badly in the polls enlists the firepower of an elite American management team, led by the deeply damaged but still brilliant strategist “Calamity” Jane Bodine (Bullock). In self-imposed retirement following a scandal that earned her nickname and rocked her to her core, Jane is coaxed back into the game for the chance to beat her professional nemesis, the loathsome Pat Candy (Thornton), now coaching the opposition. But as Candy zeroes in on every vulnerability – both on and off the campaign trail – Jane is plunged into a personal crisis as intense as the one her team exploits nationally to boost their numbers. Dramatic, rapid-fire and laced with satire, ‘Our Brand is Crisis’ reveals the cynical machinations and private battles of world-class political consultants for whom nothing is sacred and winning is all that matters. This entry was posted on Friday, December 18th, 2015 at 4:22 pm	and is filed under Film, News. You can follow any responses to this entry through the RSS 2.0 feed. You can skip to the end and leave a response. Pinging is currently not allowed. « Katherine Waterston Joins Cast For ‘Alien:Covenant’!!! Vagiclean," huh? What's the matter, honey? Little extra cheese on the taco?